We looked at the top 1 Mandoline Slicers and dug through the reviews from 6 of the most popular review sites including BestReviews, The Top Pro, Food Gear, Savant Magazine, The Healthy Kitchen Shop and more. Through this analysis, we've determined the best Mandoline Slicer you should buy. In our analysis of 54 expert reviews, the Progressive International Progressive International PL8 Mandoline Slicer placed 1st when we looked at the top 8 products in the category. For the full ranking, see below. 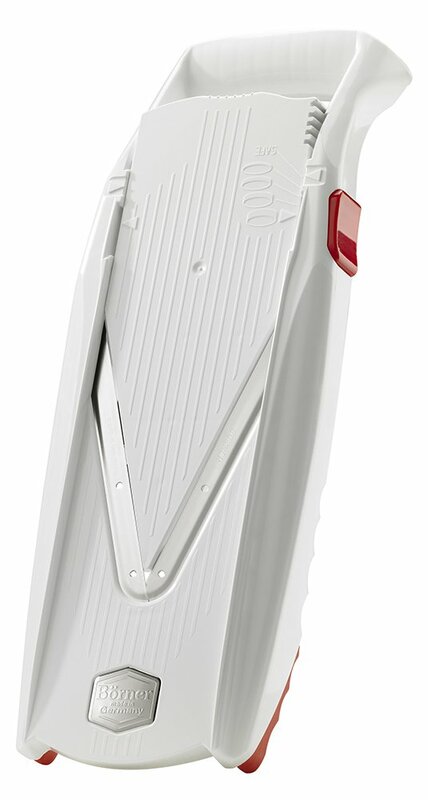 Features super-sharp, on-board blades (straight, wavy, julienne) instead of attachments. When it comes to the tool design, it is also second to none. Made of stainless steel and top-quality plastic, the food cutter is durable, wear-resistant, and will serve you for a long time. With a dial design, it is really easy to use and doesn’t have a sharp learning curve like some other tools in the market. It is also quite wide as far as its slicing deck goes, which allows food to glide easier when secured with the safety hand guard. This model gets lots of very high marks for being sturdy and having super sharp blades that make for easy slicing even on harder foods. You'll need some practice to get the hang of all cutting modes. If there’s bad news it’s that this mandoline is big, about 16 inches long, so it’s going to cost you some storage room. Our PL8 Professional Cubing Mandoline is the latest result of decades of slicing expertise and is a necessity in the kitchen. You can slice, julienne and cube with 4 adjustable slicing thicknesses. The blade adjustment knobs provide a seamless change between the built-in straight and cubing blades, eliminating loose blades or parts. Integrated blades slice even the most delicate fruits and vegetables with precision. 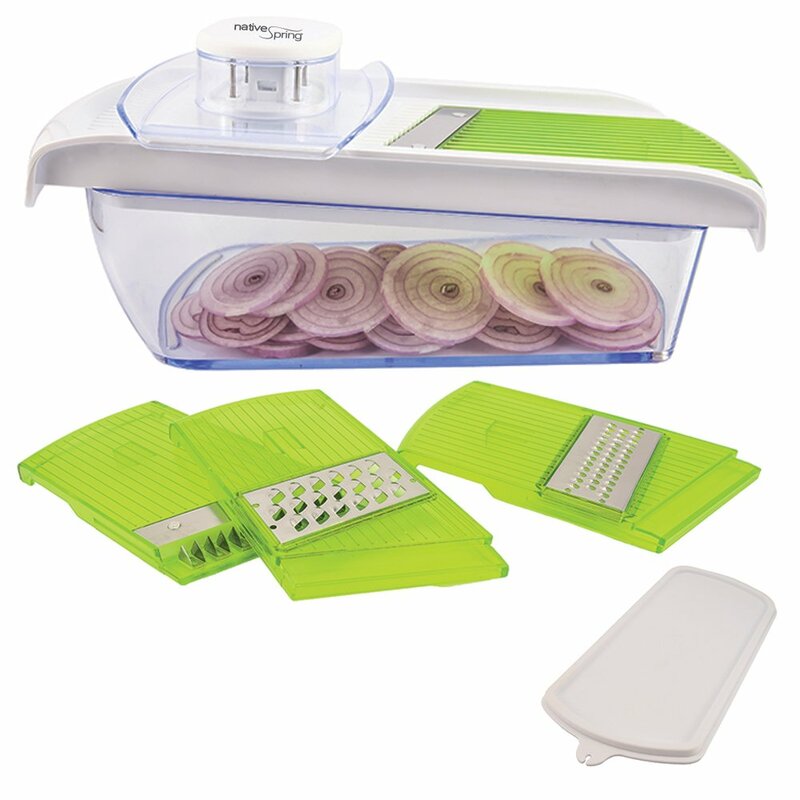 The non-skid feet on this mandoline fold in for compact storage and it is dishwasher safe for your convenience. For over 40 years, our mission has been to create innovative kitchen tools and gadgets that make food preparation fun and fast while inspiring culinary creativity. From our thinstore™ collapsibles to our sophisticated PL8™ line, our dedication to providing quality products supported by superior customer service continues to drive our creative development today. At Progressive International, we continually strive to understand the needs of today’s cooks. Our team includes talented, energetic and passionate people committed to reimagining the kitchen. We strive to pass our passion on to our consumers through our thoughtfully designed tools, layered with our avid desire to go beyond the expected. Our philosophy is simple: offer stylish designs complimented by no-nonsense functionality. We understand the kitchen is the heart of the home, where families and friends connect. Our ongoing mission is to provide exceptional kitchen essentials that help cooks of all skill levels create meals worth sharing. Prep Solutions;, Prepworks and PL8 continues to build on the Progressive; legacy by offering products that make food prep faster, easier and more enjoyable.